All users should have their own Apple ID, which is tied not only to an iCloud account, Messages, FaceTime, App Store, iTunes, iBooks, and Passbook with ApplePay, but in new versions of OS X an Apple ID can also be used to log into a Mac user account too. Because each Mac user should have their own unique Apple ID for their own devices, it can sometimes be necessary to change an Apple ID associated with an iOS device or, in this case, a Mac running OS X. Remember, Macs support multiple user accounts with OS X, and accordingly multiple Apple ID’s can be used on a single computer with those different user accounts. For example, your personal Mac user account could use one Apple ID associated with your iCloud and iOS devices, while your spouses user account could use a completely different Apple ID that is associated with their iPhone. In fact, it’s a really good idea to keep Apple ID’s and user accounts separate, not only for privacy purposes, but so you don’t have overlapping messages, FaceTime, Contacts, etc, but also so that you can have a much easier time preserving and restoring backups for your individual Apple devices. The ability to separate user accounts like this is one of the main differences between how Apple IDs can function on a Mac in OS X versus iOS, where on the mobile side, only one ID can be used because there is no user account differentiation on an iPhone or iPad. 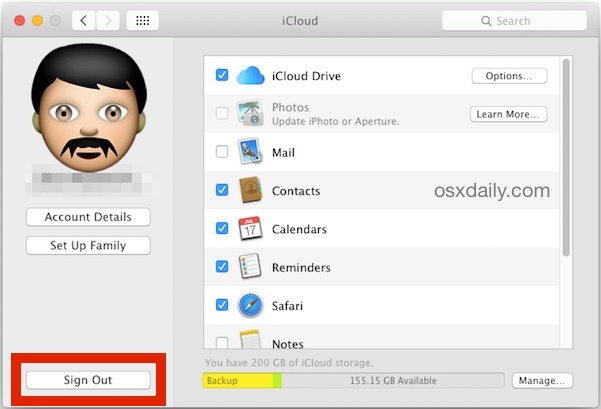 Take advantage of this ability in OS X, it’s very helpful. For a new Mac user account that doesn’t yet have an Apple ID, the option to create one is included in the System Preference panel for iCloud. You can also choose to create one on an iPhone or iPad, or through the Apple “My Apple ID” website here. Remember, changing the iCloud and Apple ID will impact your logins to iTunes, App Store, Messages, FaceTime, Contacts, Calendar, and much more. If you’re wanting to use a different Apple ID for a friend, family member, roommate, a talented housecat, or another individual, you’re better off creating a new user account in Mac OS X and logging into that other user account to sign specifically into the other Apple ID. That way you don’t need to change an Apple ID and all associated aspects of it, like your iCloud data, Contacts, App Store details, cloud documents, and all else that is related. Of course there are other reasons you may need to change Apple ID’s on a Mac too, like accessing content outside of your region, on a foreign iTunes or App Store, for example. 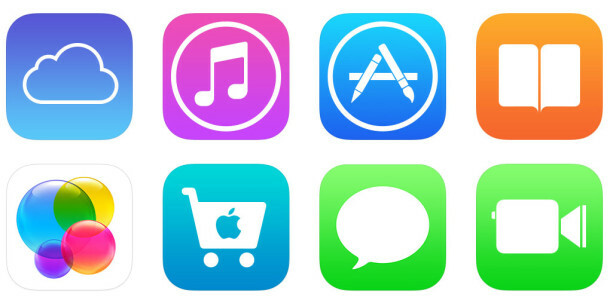 In the ideal situation, each person will have their own unique Apple ID, and only one iCloud account / Apple ID (they are the same thing, though it is a technical possibility to have a separate iCloud account and Apple ID, it is really not recommended because it can cause a variety of hurdles and issues.). Unless you have a compelling reason to stray from that recommendation, try to use the same Apple ID on all of your personal Mac user accounts and iOS devices. Any other users of your Mac should have their own unique user account and they can use their own separate and unique Apple ID for their own OS X user login and associated iOS devices too. Different iCloud’s for different user accounts is a good idea. I don’t like iCloud photo library yet and same with iCloud drive. Stick to Dropbox for files for now, cross platform too. Hello, my name can’t be displayed for… some reasons.. but… I have a problem with APP STORE… Well this is my dad’s computer and he gave it to me, well the problem is I can’t seem to access the email part of the App Store I really need to update important things. Please help me… It’s like locked into that email exactly! Yeah, those reasons would be that it’s stolen, right? haha! You’re getting your wifes text messages because you’re both using the same Apple ID, you could disassociate her from the Apple ID or in Settings > Messages and remove the email address and only have it set to her phone number. How to MERGE an AppleID is where Cupertino is sorely lacking. Wow, thank you very much. That’s what I wanted to do. I have two Apple-IDs because I didn’t know what to do when I was Apple beginner. On my iPad, I have the Apple-ID with my email-adress but on the iPhone, I have the Apple-ID with the email-adress from my parents. And now, I got a new MacBook Air and signed me in with the second Apple-ID (from parents). So I signed me in with the first Apple-ID (from me) and now I’m happy that there is one device less that uses the email from my parents :) sorry for bad english, I’m german. Thanks a lot for these very helpful informations. I would like to have your opinion on how to proceed for the following problem. I have at the moment 2 Apple IDs one for all iCloud services and FaceTime, Messages. And another one for the iTunes Store and App Store. The reason for this was that way we could share everything from the iTunes Store on all our devices. My wife has like me her own Apple ID for all iCloud services like calendar, contacts and so on. Now that apple introduced family sharing there is no reason for me to keep 2 Apple IDs and like you mentioned it is better to have one apple ID for everything to avoid problems. Now my question is how should I proceed to keep only my iTune Store / App Store Apple ID and use it for everything included iCloud and delete the Apple ID I use (at this time) for my iCloud services? Like you mention merging 2 Apple IDs is not possible. Changing the email address of the Apple ID ist only possible if the email address is not already an apple ID. My iCloud Apple ID is currently my primary Apple ID. Would it work to sign out from iCloud with all my machines and devices and to login again with my other “itunes store” Apple ID and to transfer back to iCloud my contacts, agenda, notes, Fotos and so on that I have backed up on my mac and set up Facetime, Messages, and so on again? I would very appreciate your help on this issue. I am having the same problem too. If anyone can help with this I would really appreciate it! I have the same problem. Cannot sign out of iCloud because keychain will not de-select. Please help Apple. Hi Luqmaan, did you ever get a solution to this problem? I’m having the same experience. Thanks. I tried to Sign Out of iCloud so that I could use my new e-mail but because I changed my iCloud e-mail address, there is no recognition of my old one, yet it keeps trying to get me to change the password to my old e-mail address, which I no longer have access to. Is there a way to sign out without having the old password and account? My user account has the correct apple id associated, however when I try to get updates it asks me for my spouses as thats who configured the Macbook – how can I set it to get updates, etc with mine? In a business environment where purchases need to be centrally controlled, this App Store ID is a nightmare. 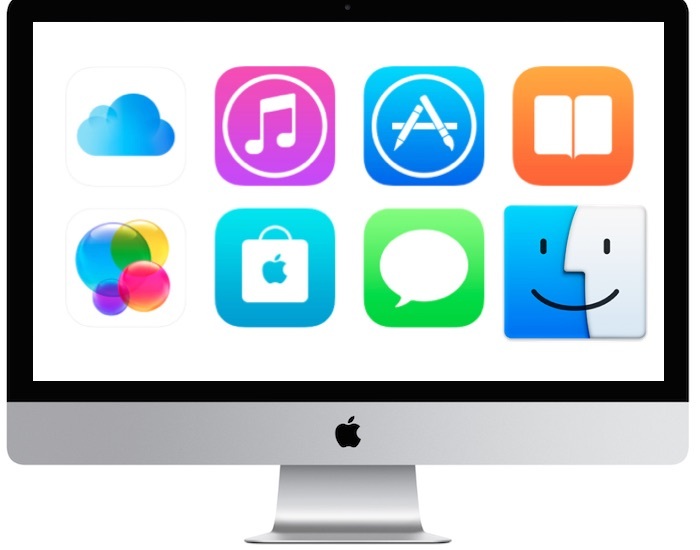 The central Info Tech group owns an account to use for purchasing software, and IT uses that account to install software on the company Mac, then distributes the Mac to the user. When the software needs updating, the Mac must come back to the centralized IT group to put in a password, just to update the software. We can’t distribute the password, or anybody and their dog will be purchasing apps with the central IT dept’s funds. We can’t have the individual users user their own accounts to buy the software because then the software belongs to them instead of to the company. Thank you for assisting me in removing my iCloud from an office MacBook Pro that I unwittingly signed into! So – I have a contacts address book on my Imac which I do not want on my wife’s phone – she has her own address book. I am normally signed in on that Imac with my apple ID. We signed in on the imac using her apple ID to sort something else out, and it wrote all my contacts into her iphone. How do we stop that from happening? I have the exact same situation! I tried the above and successfully signed into iCloudwith my own Apple ID. However, App Store still has the APple ID of the previous user. I need to update an app, and I’m stuck. Please help. in this case the best thing is to uninstall the apps that have the old AppleID-apps. But I would recommend to do a reset (Settings -> General -> Reset -> Reset all settings and content to make a fresh installation with your AppleID. What’s the best way to set my kids’ user accounts if they are under 13? I changed my apple id earliker. Trying to amend my email account in icloud. When i try to sign out of icloud it asks for the password for the previous account which I forgot and the email address is no longer valid. How do i sign out of icloud and enter my new apple id? This does not work. I’ve tried it 10 times today. When I sign out of the old owner of this mac and sign into icloud with my info it just signs me into internet services and tells me I’m not the primary icloud user. I have deleted all my internet services, then signed in again and still doesnt work. I have restarted after each step but still doesnt work. Any ideas what’s wrong? sjg, this does work, this is how you log out of an Apple ID and iCloud account and change it, what you meant to say is that you are not finding a way to make it work for you. If the old owner didn’t sign out of their account then you need to get their password to sign out of it. You are still logged into their account if their details show up. Delete their icloud info, create a new user account separate from theirs. Hi, I used my email address as my Account ID. Now it won’t let me set up my mail. What do I do? Thanks so VERY much! Clear instructions! Hi, I have problem opening my MacBook Pro because I didn’t open it for quite a long time and now I forgot the password in that device. My family wants to use it but the password is not anymore working even though I changed it already using my ipad. I received in my celphone the passcode which I informed to my family but still it is not working. it is asking for the icloud password, of which I gave my apple ID but it is showing server error. Any help please? I removed my iCloud account from my MacBook Pro (macOS Sierra) and I can still see my email on the iCloud login screen, can this be removed completely? This was all uncessary only had to do because mac sierra had keeped prompting me icloud credentials are wrong. This is really a bad way to roll out a new feature.